Like exploration, orbital stations are a bit awkward to talk about because I’d like to avoid spoiling things, and this rules out talking about all of the content currently using these mechanics. So, the mechanics are what we’ll talk about instead, with a placeholder station for reference. Before we go on, a disclaimer. Talking about pure mechanics is also tricky, because we’re talking about potential. Potential is very exciting, but often for the wrong reasons – it can mean whatever you want it to mean. Two people can talk about the same ideas, agree that they love them, and mean entirely different realizations of said ideas that the other person would hate. Finally, the details of the mechanics may point towards specific content that isn’t in the game yet. That doesn’t mean that it will be at some point, though it probably means I’m intending to look at it very closely. Whether that’ll pan out or not, though, is impossible to say until it’s actually done. All I’m asking for, then, is some brakes for the potential hype train. Really, this applies to any blog post to varying degrees – things can and do change all the time – but it feels more important to mention here, perhaps because the idea of orbital stations in battle really makes my own imagination take off. With that out of the way, I introduce to you the ISS Placeholder, an orbital station that you will (almost) certainly not see in the game. The main thing that makes this otherwise smart-looking (if I do say so myself) station a placeholder is its size, barely battleship-level. That’s not to say it could never see action in a different role, but it’s not big enough to be, say, a hypothetical battlestation defending a planet. If such a thing were a thing, which right now it isn’t. 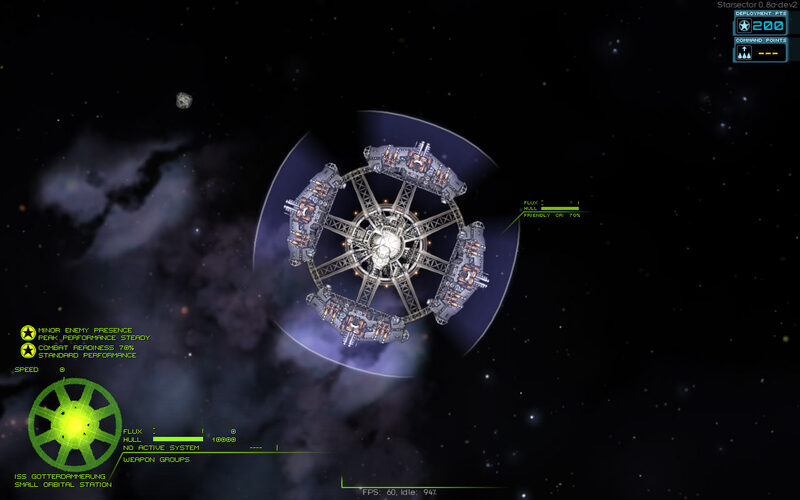 A station is made up of a “body” with ”modules” attached to it. 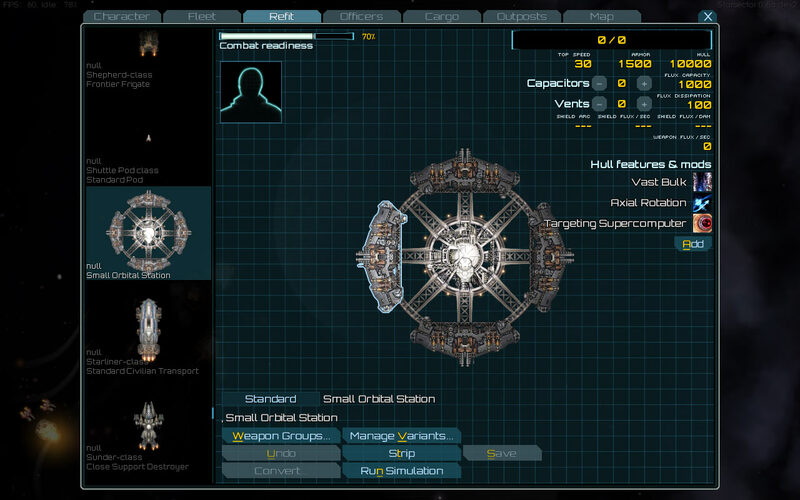 Under the hood, these are all ships that have some special properties and behaviors. Modules have their own flux pools, hitpoints, etc. When a module is destroyed, there’s a chance it will break off from the station’s body. If it remains attached, then it will break into pieces and break off once it’s taken enough extra damage. The station body itself is indestructible, though this can be configured on a station-per-station basis if needed. Conceptually, the vast bulk of the station itself can absorb a tremendous amount of punishment. In terms of gameplay, the body generally doesn’t have any weapons, and we don’t want the ideal anti-station strategy to be “take out one module, then keep attacking the body from that angle with impunity because you’re outside the firing arcs of the other modules”. 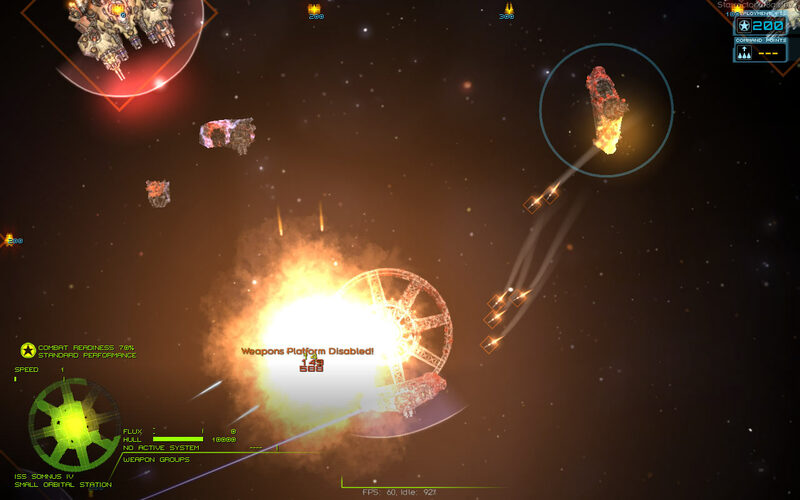 Once all of the modules with weapons are destroyed, the station itself is destroyed. This means that, for example, if there are any pure-armor modules (if those are a thing) remaining attached, that wouldn’t hold up the station being knocked out of combat. No reason to make the player take extra time to further reduce an already-defenseless station. Being a station, the station doesn’t move a lot. It’s got station-keeping thrusters to move it back into position in the event it’s moved away by a collision or some such, and that’s about it. The station also rotates slowly, making it more difficult to focus fire on a specific defensive module, especially if it’s got other ships escorting it. Gameplay-wise, this presents a clear pitfall – if anything outranges the station, it’ll be able to damage it with impunity, because the station can’t move. This isn’t very different from what large and slow ships face already, though, so the solution is a more extreme version of the “dedicated targeting core” hullmod that most large ships install to increase their weapon range and ensure they outrange smaller opponents. Thus: station modules are fitted with a “targeting supercomputer” that triples weapon range, with the exception of non-beam point defense weapons – a Flak Cannon with that sort of range turned out to be a bit ridiculous. The supercomputer also improves weapon accuracy, to help with scoring hits at extreme ranges. Naturally, all of these can be set up on a per-station and per-module basis, as necessary. If a station somehow ended up in your fleet (which outside of dev mode right now, it can’t), you’d be able to refit it. This is currently useful as a dev tool and not necessarily indicative of plans to be able to refit stations; more allowing for the potential (there’s that word again) to do that while adding a feature to make development easier. Another potential use is – and I mention this only because I’m sure you’re already thinking about it – a special ship using these module mechanics. If nothing else, I’d be surprised if somebody didn’t mod that in, and if they did, there’d be UI support for refitting it. It’s easy to forget, but any significant combat changes require the AI to be given a once-over to make sure it knows what’s going on. There were two main areas to address here. First, since station modules are treated as ships, a lot of AI logic regarding flanking, angles of approach, and so forth, had to be tweaked to check whether things are part of the same station or not. For example, if the angle was just right, the AI would back off from a station because it thought the modules could potentially flank it. Not in the “they’re on either side of me” way, which makes sense, but in the “they could move to flank me” way, which doesn’t. The second adjustment had to do with checking whether disabled ships are blocking the line of fire, since stations modules are one case where it makes tactical sense to shoot at a disabled-but-attached module to blow it up and clear the way to another, live module. Right, then. Do I need to add another disclaimer? Personally, I’m extremely excited about the potential here (and, seeing the REDACTED content that’s in the dev build, I think that’s warranted), but at the same time, there’s still a lot up in the air as far the myriad other uses this could be put to. It’s a virtual guarantee that it won’t be put to all of those uses, but I can’t wait to find out which of those do pan out. This entry was posted on Friday, September 23rd, 2016 at 2:58 pm	and is filed under Development. You can follow any responses to this entry through the RSS 2.0 feed. Both comments and pings are currently closed.